To support COMPASS and patient safety, two newsletters are being provided to the pharmacy staff. 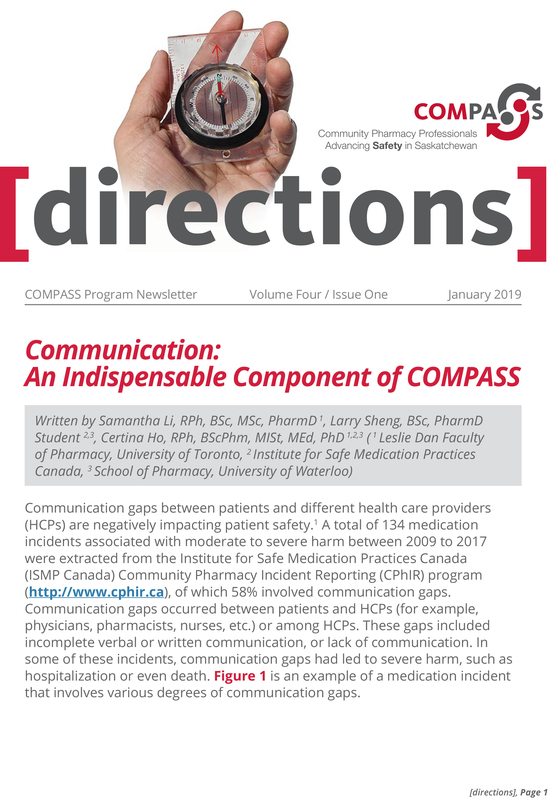 The [directions] newsletter is produced by the Saskatchewan of Pharmacy Professionals and is intended to provide pharmacy staff with information specific to the COMPASS program and medication and patient safety. The SMART newsletter is produced by ISMP, based on anonymous medication incidents reported to the CPhIR program, is designed to help initiate discussion and encourage collaboration in continuous quality improvement. The [directions] newsletter was created to provide participating COMPASS pharmacies with statistics, helpful hints, upcoming deadline reminders and other safety-related information. The [directions] newsletter is sent to all pharmacies to provide needed information on the COMPASS program. The SMART ( Specific, Measurable, Attainable, Relevant and Time-based) Medication Safety Agenda will be sent to Saskatchewan pharmacies every three months and will contain a drug-specific or process-specific topic.